WEDNESDAY’S WOW! #26 – SPINNER CARDS! I have a fun Spinner card for you today for Wednesday’s WOW! #26 I made this recently as a request from a friend. The same one who requested the 1st Birthday card in the last post. I thought you might like to see how to put one together. I was asked to make a Baby Shower card in yellow/cream colours. I wanted to make something a little different so created it as a Spinner card. This is the card using the set A Little Wild. It was the first time I have used this set – and I have had it sitting there for a while! The great thing too is that it has a back stamped image so this works great for the Spinner Cards PLUS it has matching Framelits so you don’t even have to hand cut it. This is the front of the card. I coloured the cute little lion with the Stampin’ Blends. And we have the back of the Spinner. 1. Cut a card base to a standard card size. I used Whisper White here. Cut a piece of So Saffron card slightly smaller and a piece of Whisper White smaller again. For metric I reduce the card size measurements by 4mm on each piece. For US card sizes you might like to reduce the size by 1/4″ on each piece. Of course it’s totally a personal preference. 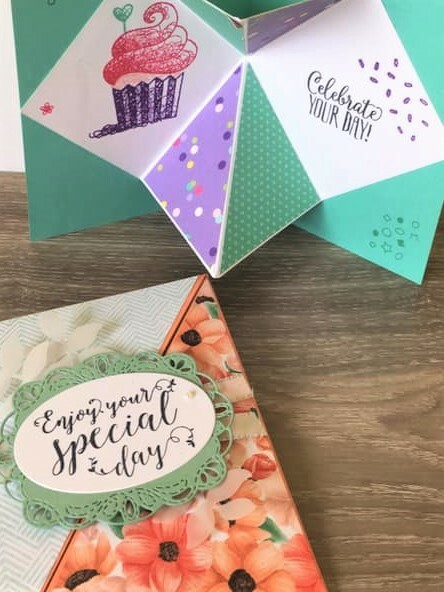 Cut a circle using the 2nd largest Circle Framelit in the Layering Circles Framelits set from your smaller piece of Whisper White card. 2. Layer all the pieces together starting with the card base then the So Saffron piece then the Whisper White. Place the next size down circle Framelit inside the already cut circle on the white. See the photo below. 3. Carefully place the card pieces in the Big Shot to cut your circle out. You may carefully remove the top white card piece if you like without disturbing the position. (Just a tip: If you are unsure you can lightly tracing the inside of the circle Framelit with pencil so you can see where to line it up if it moves before cutting it). 4. Take the White card base with the right side facing upwards. Place a length of twine or even fishing line across the cut out circle. Adhere both top and bottom with tape. I have used the thin White Baker’s Twine which has now retired on this one. Be sure that the twine is pulled tight when you are taping it down. 5. Adhere the So Saffron card piece over the top of the white card base. Before adhering the top white card piece run that through your Embossing Folder if you like to. I used the Sparkle Embossing Folder. Stamp and colour your images and then cut them out. On the back of your images run a length of Snail Adhesive on them. Place the front one over the centre of the twine. Turn your card over and adhere your other image directly on to the first one. You can now spin your images around and let it go and watch it spin. I made a Christmas Spinner card a while ago which you can see -> HERE. This was based on a similar idea but I used Designer Series Paper and one layer with the card base. Have fun spinning. I would love to see your versions. Share your Spinner cards you create by emailing me them or tagging me. I would love to see them.